It's Friday. Let's do a giveaway just for the fun of it, shall we?! Remember my review of The Search for the Delicious in which I raved about said story!? Well, I found an extra copy and I thought I'd pass it along to one of you. Would you care to win? Simply leave a comment below. This contest is open to U.S. AND Canadian residents and will be open through Thursday, September 20th. Go and read (or re-read) my review and tell me who you plan to share this book with. (You are permitted to read this by yourself and for your own pleasure. Add a Pumpkin Spice Latte to the reading experience and increase the pleasure, if you like!) Leave a second comment after reading the review. THIS CONTEST IS NOW CLOSED. THE WINNER, as selected by Random.org, IS #10 - Jessica B.
I read this book several years ago and thoroughly enjoyed it. I have already shared it with my oldest daughter, and intend to share it with my other children as they grow up. 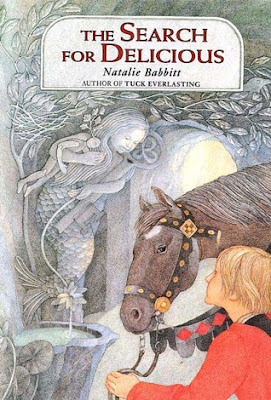 I've never read it and confess I thought Tuck Everlasting to be a bit. . .weird, but I'm always up for a new book! I'm off to read your review again. No social commentary/agenda/hidden message? Yes, please! I'll read it to my girls! i always love to share books with my amazing kids! I read the review. A villian named Hemlock! Yes please! I remember when you reviewed this! I'd love to win a copy. And even though I remembered it, I re-read your review. (-: I'd give it to my daughter. I saw your post on FB. And too bad the boys aren't old enough yet to share this with, but my mom might be very interested in it. Oh yes, I would like one!